I have a lot of tools to carve fruit and vegetables into fruit baskets, bowls, bouquets and other edible arrangements but when I saw this set online.....well, I want it! 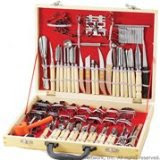 They are the professional Thai style fruit carving tools and knives with wood handles, 80 pieces in all! Carving a swan out of an apple is a simular techinque to carving the apple duck will post some picture and/or video soon of how to carve a fruit swan!